Molecular structure of two-dimensional titanium trisulfide. The rise of 2-D materials -- sheets no more than a few atoms thick -- began with the 2004 demonstration of graphene, which remains the strongest and thinnest material known. Zeng and Sinitskii have published two recent studies showing that titanium trisulfide compares favorably not only with graphene, but also phosphorene and molybdenum disulfide -- fellow 2-D materials that have shown great promise for electronic applications. "There was no interest in the properties of few-layer titanium trisulfide until now," said Zeng, an Ameritas University Professor of chemistry. "We were among the first to look at them, and we've been very excited by what we've seen." Zeng's theoretical study revealed that 2-D titanium trisulfide has the potential to transport electrons faster than phosphorene and molybdenum disulfide. This "electron mobility" helps dictate the speed of transistors, the devices that control electric current and amplify electrical power in technology ranging from cellphones to spacecraft. Transistors also form the core of semiconductors, which rapidly switch between a current-conducting "on" state and current-insulating "off" state to represent the 1s and 0s of digital computing. Graphene boasts unparalleled conductivity, but crucially lacks the quality that can turn it off: a band gap, which describes the energy necessary for electrons to jump from their near orbits around atoms to an outer "conduction band" that promotes conductivity. Zeng and Sinitskii found that titanium trisulfide has a moderate band gap that approximates the one found in semiconductor favorite silicon, making it ideal for the on/off switching prized in such devices. The material also yields a large disparity between "on" and "off" conditions, which helps distinguish between resulting 1s and 0s. The material's band gap also allows it to absorb elementary particles of light known as photons from most of the sun's emission spectrum. Because of this, titanium trisulfide could also prove useful in solar-cell designs, Sinitskii said. Sinitskii, an assistant professor of chemistry, followed up on Zeng's theoretical calculations by combining titanium and sulfur to form a block of titanium trisulfide. He then used adhesive tape to rip off microscopic whiskers of the compound in the same way that the pioneers of graphene did with graphite more than a decade ago. Sinitskii turned those whiskers into transistors and directed the performance tests that confirmed his colleague's work. "As a theoretician, I always want to predict something," Zeng said. "The dream for us is that somebody makes it in the laboratory. "I couldn't help but tell Alex. He's one of the leading experts in the world when it comes to making two-dimensional materials, and he did it just a couple of months after (I asked him)." Sinitskii said the 2-D predecessors of titanium trisulfide should help accelerate his team's efforts to study and improve it. "When people started working with devices based on graphene, the first two-dimensional material, everything was new," he said. "Researchers studied how different parameters affect device performance. When they started working on other 2-D materials, the knowledge generated from graphene research was very useful. "In our case, we're actually in quite a good position, because we can learn a lot from those earlier studies and apply prior knowledge to making better transistors from titanium trisulfide." Zeng's recent study, published in the journal Angewandte Chemie International Edition, was co-authored with postdoctoral researcher Jun Dai. The researchers performed their calculations through UNL's Holland Computing Center. Both research teams received support from UNL's Materials Research Science and Engineering Center, part of a nationwide network of MRSECs sponsored by the National Science Foundation. 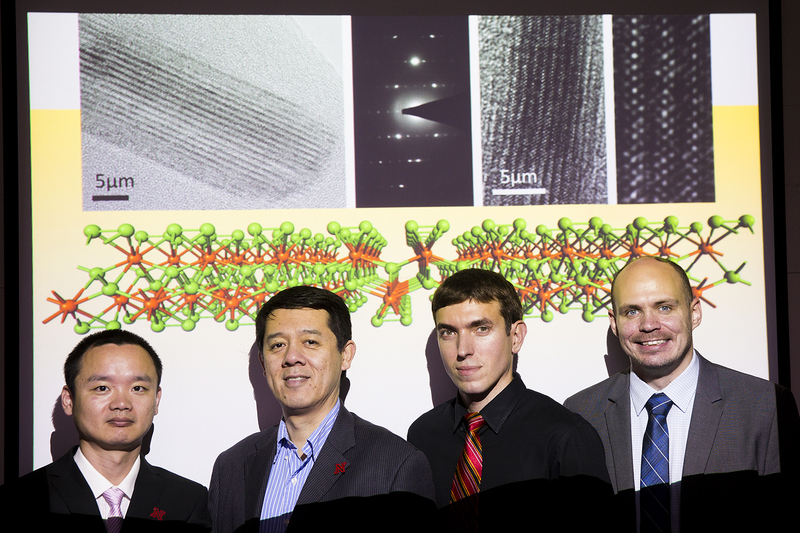 They conducted their work in conjunction with the Nebraska Center for Materials and Nanoscience.